You are here: Home / Not a Fan of Flossing? Try These Alternatives. First there was the toothpick, then there was floss, and now there are a bevy of new dental tools making their way to the shelves of your local stores. Why the need to keep innovating? Simply put: plaque removal is just not fun…but these alternatives sure help! For those fed up with flossing, or the many who fail to follow through with it altogether, gingivitis is not inevitable. Give these new solutions a try and say goodbye to knotted string, cramped fingers and excessive plaque build up for good. If you’re overwhelmed by all the new dental care products available, this could be a solid upgrade for you. Floss is strung tightly between two points to provide optimal tension no matter your angle of approach, with a handle for added comfort. Some varieties even come with a tongue scraper as an added bonus, and most are sold in convenient bags that make sharing more hygienic and easy. Now you can completely forget manual flossing and let an electronic device do the job. Similar in appearance to the floss pick but attached to an energy source, vibrations are emitted to remove plaque quickly and efficiently. Having the flossing motion done for you can make the process faster, but you should pay extra attention to the speed setting and pressure applied to your gums to avoid bleeding and other oral injuries. It doesn’t get much simpler than this. 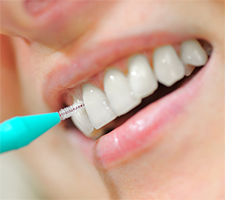 Instead of using string, a small brush with fine bristles is inserted between the gaps of your teeth. One swift motion in and out is all it takes, quickly removing plaque and gently (but effectively) stimulating your gums in less time than floss. No sawing and string winding are necessary, and it can be done with one hand. For comfortable, yet efficient plaque removal, oral irrigators are your best bet. Instead of floss, picks or brushes, strong pulses of water are directed between your teeth to dislodge bacteria and stuck food particles. Oral irrigators are also effective at removing tonsil stones, a common cause of halitosis (bad breath). Home devices can range in size with varying speed options, but portable options also exist for added convenience. Any of these solutions is better than not flossing at all, but a little research and even a few product trials can help you figure out the best floss alternative for your budget and lifestyle. Consulting with your dentist can also help narrow down your options based on your oral health. He or she may recommend one option and advise against others due to individual factors such as gum sensitivity, past dental work and orthodontic hardware. For added assurance on the safety and effectiveness of the product you choose, look for the American Dental Association (ADA) seal of approval on the packaging. Finally, always proceed with extra care, and stop immediately if you notice excessive bleeding, receding gum lines or other issues you think may be linked to a flossing/plaque removal product. http://woodviewos.com/wp-content/uploads/2017/03/woodview_oral_surgery_logo-300x97.png 0 0 StarlightSocialDC http://woodviewos.com/wp-content/uploads/2017/03/woodview_oral_surgery_logo-300x97.png StarlightSocialDC2019-01-31 10:12:312019-04-17 11:53:51Not a Fan of Flossing? Try These Alternatives.